There are occasional days at work when I get a lunch break. Sometimes it is long enough to get home and back, often it’s not. Given an hour of free time in the basement, what might you do? Well, usually I go and have a look whether Nick Lane's group has any new publications up. Pondering the origins of life is a great relief from the problem solving with limited information that makes up clinical work. In recent months I’ve usually had three browser windows open to try and get an accurate understanding of what he and his coworkers are specifically saying. As a preamble to discussing those methanogens and acetogens which do not use cytochromes I would just like to lay it on with a trowel that these strict anaerobic organisms are not “living fossils” or in anyway primitive. They appear to be using a method of carbon fixation which is developed from that of the first prebiotic synthesis. That does not make them simple. If this is the first technique for carbon fixation it has been developing for well over 3 billion years. It’s still used nowadays because it works. 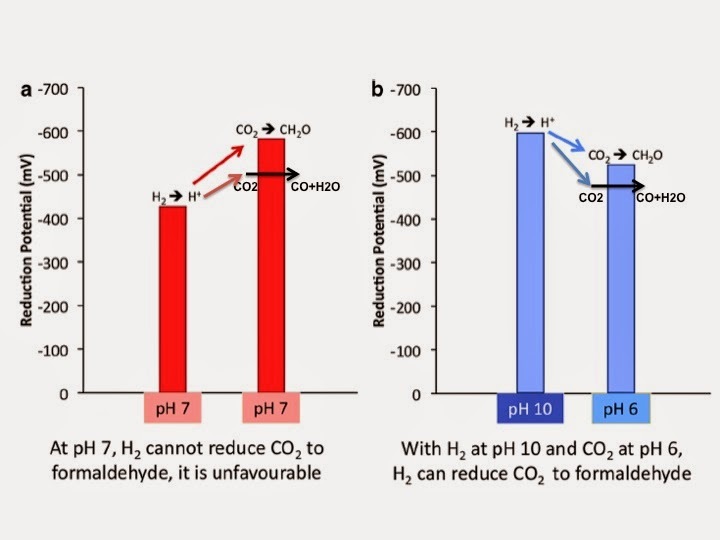 This shows that hydrogen is unable to reduce CO2 to formaldehyde at pH 7. However, if you introduce a pH difference across a thin FeS barrier, it appears to be possible to put an electron or two on to FeS clusters which can then drive the reaction. At the risk of spoiling the paper, it works. Yield is low, but it's there. There is a lower barrier to be overcome and, given the suggested pH gradient, greater likelihood of the reaction proceeding. I think the group are interested in formate and formaldehyde because they have the potential to do many things other than generate acetate/methane plus the reactions from there onwards are exergonic. 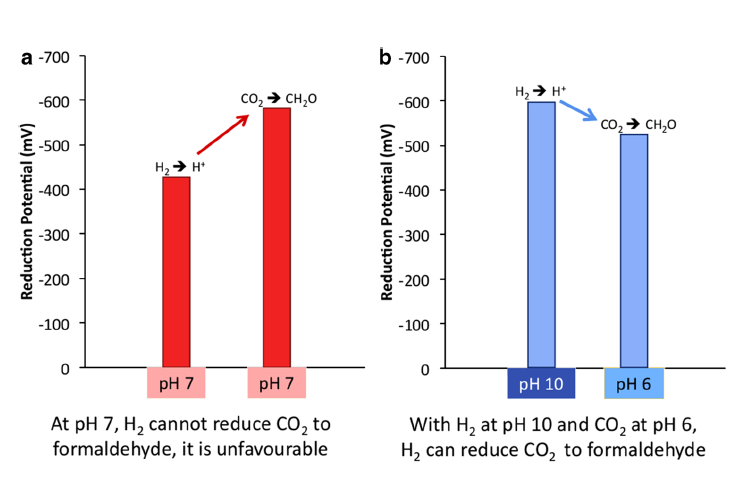 If we work down from the CO2 at the top of the dashed line rectangle we can see that CO2 is being reduced by electrons from a very low potential FeS cluster (just where it says +2[H]), generated as in my modification of the blue bar chart above, using the pH gradient across a thin FeS barrier. The FeS cluster on the right is the actual catalytic cluster and the green sphere is a Ni atom crucial to its function. The CO diffuses to a second FeS catalytic cluster which is doped with two more Ni atoms, shown as two green spheres. 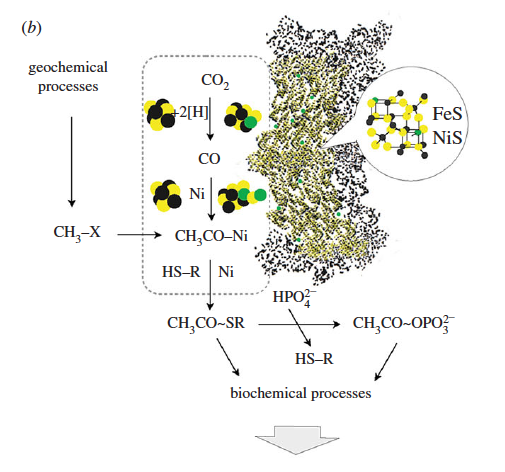 This reaction does not need a low potential FeS group, so I'm not sure why the black/yellow cluster is shown to the left of the "Ni" in the diagram, excepting that modern ACS does have an FeS cluster covalently attached to the FeNiS catalytic cluster. Doesn't make the diagram particularly easy to interpret. Anyhow, the CO binds to one of the two Ni atoms and waits for a methyl donor. The methyl source is on the far left of the diagram, shown as CH3-X. This has to be of abiotic origin in an origin-of-life scenario and the simplest is undoubtedly CH3-SH. This methyl group attaches to the CO on the Ni atom and we then have CH3-CO- attached to the catalytic site. Thiolysis using a source of sulphydryl (shown as HS-R in the diagram, below the CH3CO-Ni, still within the dotted rectangle) generates a thioester of acetate, shown (outside the rectangle) as CH3CO-SR.
We've already speculated the availability of CH3-SH in vent fluids to supply methyl groups, so we could simply replace HS-R with HS-CH3 i.e. CH3-SH can provide both the methyl group and the sulphydryl group for the above reactions. The only step requiring any energy input is the initial reduction of CO2 to CO using a low potential FeS cluster. So when you supply CO and CH3-SH to a slurry of FeS and NiS you get CH3CO-S-CH3 of abiotic origin. This was done back in 1997 by Huber and Wächtershäuser. The trick of reducing CO2 to CO is the hard knot to pick and which needs FeS and a proton gradient, not available in the slurry. The thioester can hydrolyse to heat and acetate but more interestingly it carries enough energy to form a phosphate derivative which retains slightly more available energy than ATP. After translating this in to a system which has developed genes and proteins, we still the have remnants visible. This is the modern version of what we have been looking at previously, with the two Ni doped FeS clusters on the right hand side. 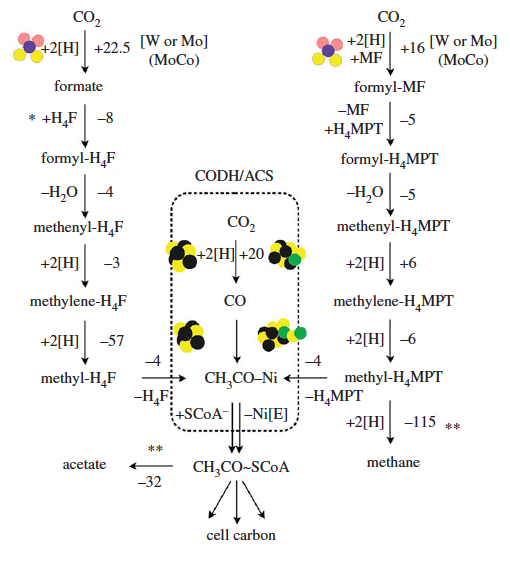 The reduction of CO2 to CO is no longer accomplished using a proton gradient, in fact these archea and eubacteria use a sodium gradient rather than a proton gradient. Instead, a low potential ferrodoxin protein with two FeS clusters is generated in the cytoplasm using electron bifurcation from molecular hydrogen (not shown, discussed here, that's the third window in my browser!). The systems used differ between methanogens and acetogens but the core energy currency for both is still reduced ferredoxin. This ferredoxin looks, to me, like a fossil of the FeS on a proton gradient which provided reducing power in the initial scenario. The transport of CO to the second FeSNi cluster is down a molecular tunnel in the modern enzyme but the binding to a Ni atom at the end of that tunnel persists. Source of the methyl group is quite different between archaea (methanogens) and eubacteria (acetogens). This differing arrangement suggests development after the divergence of the two lineages. The use of CH3-SH to form a thioester has been replaced by the use of coenzyme A, giving us the familiar acetyl-CoA (shown as CH3CO-SCoA) below the rectangular box. This can be used for substrate level phosphorylation of ADP to ATP or can be used as a source of cell carbon for metabolism. There is a lot of interest along these lines in this paper: The stepwise evolution of early life driven by energy conservation. There are some interesting ideas which stem from this believable scenario. Substrate level phosphorylation is clearly very ancient. There are suggestions from the speculated origins of ATP synthase that ATP usage may have been common before this enzyme complex was developed. The possibility of generating an ATP-like moiety was present when all that was available was a proton gradient derived reduced FeS cluster and some CH3-SH. Carbon fixation does not appear, initially, to have involved proton translocation, though the gradient was essential. Carbon monoxide is utterly intrinsic to the formation of life. Strange, that. Steven Nissen, chairman of cardiovascular medicine at the famed Cleveland Clinic: For years, "we got the dietary guidelines wrong. They've been wrong for decades." Advice to avoid foods high in fat and cholesterol led many Americans to switch to foods high in sugar and carbohydrates, which often had more calories. "We got fatter and fatter," Nissen says. "We got more and more diabetes." Recent studies even suggest that longtime advice on saturated fat and salt may be wrong, Nissen says. Steven Nissen, chairman of cardiovascular medicine at the famed Cleveland Clinic: For years, "we got the cholesterol guidelines wrong. They've been wrong for decades." Recent studies even suggest that longtime advice in favour of statins was a bad as that against saturated fat and salt, Nissen says. Y'all know it's coming! You saw it here first. I just wanted to throw out a few comments about the inhibition of ketogenesis by protein. The obvious effect, that of stimulating gluconeogenesis, appears to be at best a partial explanation of what happens. I've long been interested in how amino acids feed into (and are derived from) the citric acid cycle and related pathways. Clearly any amino acid which metabolises to oxaloacetate within the liver is simply going to remove that void in the citric acid cycle (oxaloacetate deficiency) which results in acetyl-CoA being diverted to ketogenesis. Aspartate is one such. Those metabolising to pyruvate are also going to do essentially the same thing. There is no need for increased gluconeogenesis in this scenario. Gluconeogenesis may happen at a increased rate. It may not. Providing a source of oxaloacetate in the liver mitochondria will stop ketogenesis, whatever gluconeogenesis does, whatever insulin does. Personally I am very ketoadapted. I've drifted in and out of ketosis since just after that start of the current century, probably around the summer of 2001 if I recall correctly. I find carbohydrate restriction effortless. Limiting to 30-40 grams per day is easy. 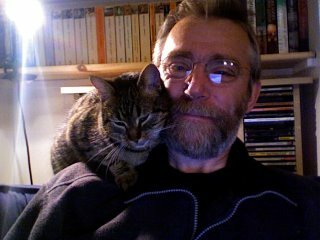 Protein limitation is much more difficult. With about 20grams of protein in each breakfast and a few grams derived from cream, chocolate or macadamias at lunch time this does not leave a huge allowance for meat intake at suppertime. At around 65kg bodyweight nowadays keeping to 1g/kg is not the easiest target. A decent steak and I miss it. Life is too short to stress about this, but I certainly don't eat steak every day. Urinary ketones are always there at the + or ++ level. Exercise (distance walking) usually gives +++ as does the evening meal post prandial period, unless there have been excess chips with supper or I've gone significantly over my protein limit. So I've limited protein, mildly, for years. My degree of keto adaptation still allows free generation of ketone bodies, certainly to a level where I can detect acetoacetate in my urine. For some reason the concept of amino acids being derivatives of (and inputs towards) the TCA pulls me back to Nick Lane's ideas, the origin of life and the throwing together of metabolism. I'm willing to buy the reduction of CO2 by H2 to give formate as the starting point of metabolism. There is an energetic cost to this initial step but once going it's all down hill, energetically, to pyruvate. Many amino acids are formed from pyruvate and close derivatives. This makes sense. Evolution doesn't plan but does progress within the framework of what is available. In modern biology DNA doesn't do very much other than replicate (I simplify). RNA is much more active, it carries the message out, assembles itself in to ribosomes and does all of the picking and choosing of amino acids etc to make a protein. I like to think of DNA as a rather stable "hard copy" of the information which was originally carried by the less stable RNA. As such DNA is the fossilisation of the amino acid preferences of primordial RNA. Written in to DNA are the remnants of what was probably a chemical associations of RNA with specific amino acids. If DNA specifies a cytosine at the start of a triplet then the amino acid chosen via transport RNA will be derived from alpha-ketoglutarate, if an adenine the coded amino acid will be oxaloacetate derived, if thymine it comes from pyruvate and if guanine the amino acid will be derived from any one of several possible small molecules. The second base specifies how hydrophobic/hydrophilic the chosen amino acid might be and these two cover a high proportion of the biological amino acids. The third base is degenerate, i.e. it doesn’t carry any specific information but does allow a wider pool of amino acids to be selected. I'm afraid this is all rather cool to me. I love these glimpses in to the early mish-mash of chemicals and how they might have interacted before life became seriously organised. What you can and cannot say about LUCA, the last universal common ancestor, and the first steps away from prebiotic chemistry, is largely determined by such biochemical fossils. All of this random musing came from wondering whether amino acids might supply oxaloacetate and so suppress ketosis. Some do.